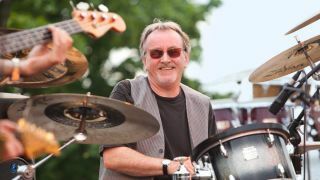 Before leaving the UK for New England back in 2000, Dave Mattacks was one of the UK’s top session drummers, known for his musically sensitive way with backing up a plethora of singer-songwriters from Joan Armatrading to Richard Thompson and Paul McCartney. Dave is back in the UK for his annual spring jaunt with Feast Of Fiddles. Fronted by six top fiddlers, it’s the collective’s 25th annual UK tour, as they roam from traditional folk through contemporary folk-rock with the odd curveball thrown in. A swing arrangement of a film score perhaps, or a sly segue into Led Zeppelin’s Kashmir. Although atypical, the latter is the perfect vehicle for DM’s economic, strong and fastidious drumming - his unlikely old 1970s mate Bonzo would certainly approve. Mattacks’ folk connection traces back to his breakthrough with UK folk-rock masters Fairport Convention in 1969. From this platform he built a wide-ranging session career, culminating in appearances on five Paul McCartney albums. His CV lists hundreds of albums and artists including George Harrison, Elton John, Nick Drake, XTC, Jimmy Page, Brian Eno, Mary Chapin Carpenter, Rosanne Cash, John Martyn and Jethro Tull. As the session world diminished in the UK he found himself drawn to the north-eastern USA. Thus from 2000 he has carved out a new scene in the Boston area where he’s still very much active with live and recording work. His special talent for making singer-songwriters comfortable owes to his multi-faceted ability to play piano and bass, and with a huge thirst for furthering his musical and drumming knowledge, he also now produces and arranges. DM, what was the first kit that you ever owned? Did you take lessons or were you self-taught? 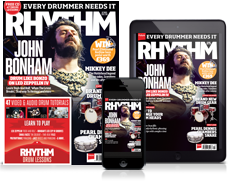 “I had some lessons early on from Johnny Joseph, a Southend-based drummer who was playing in the London ballrooms. He got me started with the basics of reading and showed me various rhythms, such as the foxtrot, rhumba, etc. It was all very helpful. Who did you look up to as a young drummer? What was the first song that you learned to play? How did you develop your drum sound? What is the key to your playing style? “In terms of people I’ve been fortunate to work with, that’s reasonably well documented, but getting to play Ronnie Scott’s Club for the first time - in the mid-1990s I believe - with Liane Carroll was definitely a high point. What do you think is the key to longevity as a musician? Dampen the kit or let it ring? Who do you see as an underrated drummer?